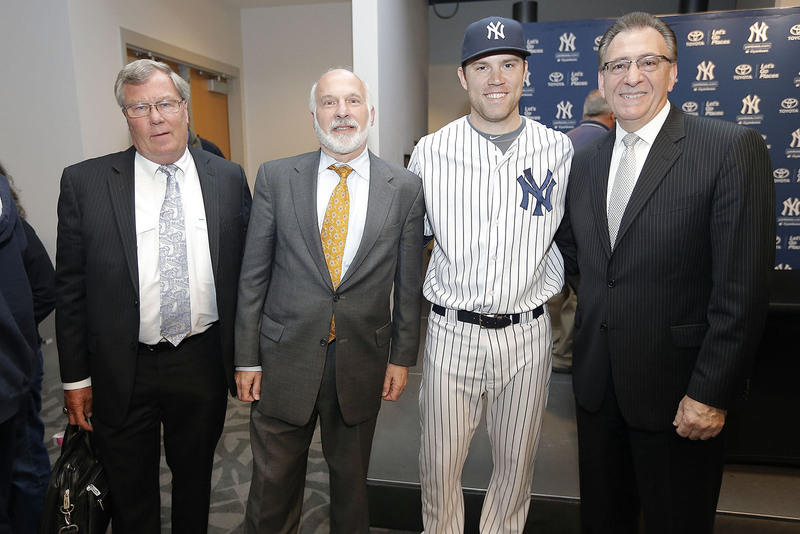 Photo credit: New York Yankees. All rights reserved. BRONX, NY (May 30, 2014) – The Professional Baseball Athletic Trainers Society (PBATS) and The Arc announced today at Yankee Stadium a partnership to promote the inclusion of people with disabilities in sporting activities nationwide. In 2014, The Arc – a nonprofit organization that aims to promote and protect the human rights of people with intellectual and developmental disabilities – will contribute through the involvement of their local chapters and children with disabilities at PBATS’ PLAY (Promoting a Lifetime of Activity for Youth) Campaign events nationwide. Representing PBATS at Yankee Stadium Friday were founding members Gene Monahan (New York Yankees Head Athletic Trainer, 1973-2011) and Gene Gieselmann (St. Louis Cardinals Head Athletic Trainer, 1969-1997); Senior Advisor Neil Romano (former Assistant Secretary of Labor for Disability Employment Policy); and Head Athletic Trainers Steve Donohue (Yankees) and Dave Pruemer (Minnesota Twins). The PLAY Campaign – conducted at all 30 Major League Baseball stadiums each season – is a public awareness campaign of PBATS. The campaign is designed to help combat childhood obesity and promote a healthy and active lifestyle by promoting fun activities and good decision making. Originally developed in 2004, PLAY is now the longest running health campaign in professional sports directed specifically at young people. The PLAY Campaign events are typically two hours in length and include stations hosted by experts from across the United States. This year, for the first time, children with intellectual and developmental disabilities from chapters of The Arc will participate alongside children without disabilities at these events. The campaign event stations include the Henry Schein Cares Foundation’s presentation on oral hygiene, the Taylor Hooton Foundation’s presentation on appearance and performance enhancing drug education, baseball specific activity stations with Major League Baseball athletic trainers, an educational session with regard to nutrition tips and a question and answer session with a Major League player from the hosting team. PBATS members will host the PLAY Campaign events in all 30 Major League Stadiums in 2014 where they will educate over 2,000 young people and their parents. This entry was posted in Press Releases and tagged PBATS, Peter Berns. Bookmark the permalink.